I took a 6 day tour with SLT during a rather active period in the, otherwise, slow season of 2018. We got to see the Cope, CO, tornado outbreak which was a real treat. I had a great time with Silver Lining Tours, much thanks to the great crew with Roger Hill as a tour guide. I felt like the tour was very professional and with good attention to detail. Our tour was combined with the Photography Tour and we also had an extra vehicle so all in all we were 5 tour vans so it felt quite crowded with some 35 tour guests. Roger was great in handling it though but it also meant you only spent 1/3 of the days in the same van as Roger, the tour guide, and the rest with only a driver. All in all, it was a great tour and I felt very confident that Roger would find any tornadoes around. I can recommend you to chase with SLT, especially if it is your first tour as they are a very safe option. You will have optimal chances of seeing tornadoes and you will be surrounded by very competent staff. Please read my full review in the linked blog post! 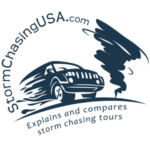 Roger Hill is a really great tour guide and a superb storm chaser. Super professional, very likeable, and very experienced. He was always eager to help, enthusiastic and handled the tour guests in a very good way. I have nothing but good things to say about him! SLT use the same type of vans as most other tour companies and they are not too comfortable unfortunately. I miss neck support, curved seats and leg room. On the positive side, they are great to watch storms from with large windows. We had electrical sockets to charge laptops/iPads etc and the vans were nice and clean.